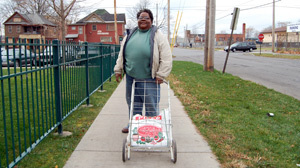 Wilson and her neighbors used to bring their carts to the local P&C grocery store before it closed. Now, they go to the corner store where Wilson says food is often expired and overpriced. Shopping for this year's Thanksgiving dinner in Syracuse, N.Y.'s, South Side has been more difficult than usual: The community has been without a neighborhood grocery store for more than a year. "It looks so sad on your eyes where P&C was," said Mabel Wilson, remembering how she used to walk down the street to the store. "There were a lot of cars there, and the neighbors would be shopping. I would see my neighbors with their push carts. That's how close it was for us to go to that grocery store. "But no more," she added. "I miss that." It's a problem Wilson shares with her neighbors on the ailing South Side of Syracuse, a neighborhood that too often seems defined by high unemployment and vacant buildings, where community residents had to find other places to buy their staple foods after the P&C grocery store in Valley Plaza on South Salina St. closed. Neither she nor her neighbors have been given a straight explanation as to why the store closed. They also don't know why another chain hasn't taken the vacant store's place. But Wilson and her neighbors are not waiting for answers. They're building a grocery store of their own. On Nov. 19, Jubilee Homes, a nonprofit development agency, announced the purchase of property at 601 South Avenue, in the heart of Syracuse's South Side, for $350,000. There they hope to build a community-run grocery store. Funding comes from a $3 million settlement with the county over the building of a sewage treatment plant in a South Side neighborhood. "The goal for the organization is for the grocery store to be built from the bottom up," said LaRhonda Ealey of Jubilee Homes. "We want it to be community-driven. We want to get the community's input." Walt Dixie, Jubilee Homes' executive director, told a community meeting Nov. 19 that he wants to try a Pathmark model for the new grocery store. As he explained, Pathmark was conceived by a group of clergy in New York City's Harlem neighborhood who saw the same void as Syracuse neighbors see. Dixie called the plan a "win-win" situation, as the store will provide the community with fresh produce at an affordable price and an accessible location, and keep the economy of the ailing neighborhood alive. He added that he wants to "keep the dollars recycling in the community, keep the community growing." The idea is to have South Side residents staffing and running the store. Dixie sees it as giving young people chances, too. "We see them as the investors," he said. "This is their community." Ealey believes the project is going to work. "When the community is a stakeholder," she said, "they are able to take pride in it. They are able to take care of it. And that will be key in sustaining the project." Jubilee Homes will be receptive to community questions and input. Much of that, they say, will come in December, when the next public meeting is scheduled. Until then, Wilson will shop at the local corner stores, where she says food is often expired or overpriced, and where people sometimes loiter outside, creating a potentially unsafe climate. Or she'll rely on her daughter to drive her to the nearest grocery store, which isn't even in the city. When her daughter isn't available, she and others who live in her apartment complex pool their money for gas and share a car. It's money "we don't have," Wilson said. "It's just ridiculous the things we have to do to get food in our houses." But the promise of a new store provides hope, and Wilson is committed to it. Thanksgiving shopping may be easier next year. "We all are trying to work together," said Wilson, "to get a grocery store. We aren't going against each other, we're just trying to sit down at the same table to have a conversation to get the process in motion." ABCNews.com contributor Matt Markham is a member of the Syracuse University ABC News on Campus bureau.